To help you with your training here is a list of foundation course material that we have found useful. These include the prescribed course text books together with some additional items that should prove useful. 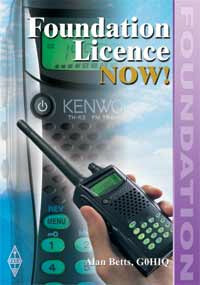 Foundation Licence Now! is the prescribed text for the Amateur Radio Foundation Course. You can purchase it directly from the RSGB (where RSGB members get a discount) or from other suppliers such as Amazon. Written by Alan Betts, Foundation Licence Now! provides a basic introduction to Amateur Radio in the UK. Even if you just want to know about Amateur Radio this book provides insight into the technical basics, receivers, transmitters and antennas. How and where to operate with your new licence are covered along with safety considerations and electromagnetic compatibility. 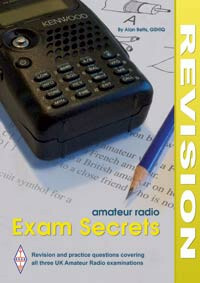 We love this book as it is a great way to revise and practice for your amateur radio licence exams. It covers all three levels of the amateur radio licence and includes sample exam papers together with copies of the reference material provided to candidates in their exam. Each section is numbered as in the syllabus and has a brief introduction to the material, followed by a number of sample questions. Our training covers the full Foundation Course Syllabus and it is a good way for candidates to check that they understand the material. It also provides a breakdown of the number of questions asked per topic which can be very useful when planning your revision. You can download a copy of the syllabus here. There are a couple of sample papers for the Foundation Course. These are a great way of testing your knowledge with a real exam. You can find the sample papers here. Candidates are provided with some reference material to use when answering questions on the exam paper. You can download of copy of this reference material here. The HAM Tests website provides an excellent way of testing your knowledge and understanding as you progress through the courses. HAM Tests contains hundreds of questions at each level and allows candidates to sit a full exam or just a selection of questions. It is great for helping identify the sections of the syllabus where candidates might need to focus their revision. We highly recommend this site. We are luckly to have a huge amount of technical knowledge within our club membership. We actively encourage our candidates to attend the monthly club meetings in St Albans and to ask questions to our members. There is always someone who can provide advice and guidance.